On a warm and windy morning eight teams gathered on the magnificent grounds below the castle at Entrecasteaux to battle for the prestigious title of being the 7 aside champion team of France. 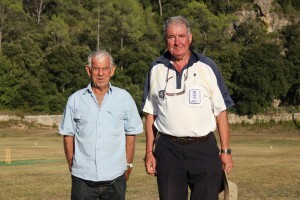 The tournament was yet again sponsored by Blevins Franks, the financial services company, represented by Simon Eveleigh, who also had the honour to lead the Entrecasteaux 2nd VII. 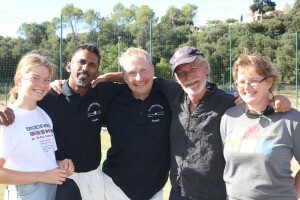 The other teams represented were the Cote d’Azur Cricket Kings CC, Marseille CC, Entrecasteaux 1st VII, Beausoleil CC and Colgans Beer and Bacon CC from France, and the Cambridge to Casablanca CC and tournament favourites, having won the trophy for the last three years, Cadogan Tate CC from the UK. The draw to split the eight teams into two leagues left Cambridge to Casablanca, Entrecasteaux 1st VII, Colgans Beer and Bacon, and Beausoleil in league 1 with the other teams making up league 2. Battle was to commence, unusually punctilious, in this unusual format of the beautiful game in which each team in their respective league has to play the other 3 teams in a six over innings with all players of the fielding side having to bowl one over. The bowlers are generally not very happy in only having one crack at the whip but the rules state that should there be a points tie at the end of the league matches then the side with the most wickets will progress to the final. 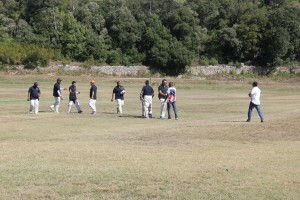 This was to be a vital element for one of the teams in making the final. In general each game lasts an hour, the action is fast and furious and there were some surprising results. Perhaps the biggest shock was that Cadogan Tate failed to win a match in league 2 which is probably more symptomatic of the other teams in their league, having played in the tournament in previous years, being better prepared in their approach to the 6 over innings. 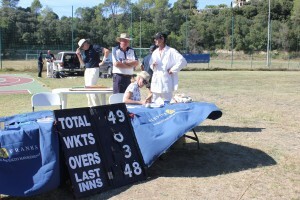 So it was that the other 3 teams in league 2 each won 2 games but it was Entrecasteaux 2nd VII, who claimed 7 wickets in their 3 games, who prevailed to the final with Marseille and Cote d’Azur Cricket Kings claiming only 3 wickets each. So Entrecasteaux 2nd VII batted in the final with Devakumar Selvam making 30 and Ian Stuart making 34 not out, and with a few extras the total amassed was 75. Beausoleil reached their target with 4 balls to spare in a tense and exciting final to claim the 7 aside championship of France and the very fine Blevins Franks trophy. 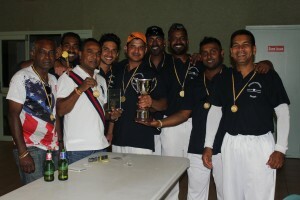 It was another excellent tournament played in good spirit. Cambridge to Casablanca definitely fielded the strongest bowling attack. Entrecasteaux 1st VII’s Brad Edwards was awarded the tankard for the highest score during the day, he made 56 in 6 overs so he wasn’t there just for the beer. Talking of which Colgans Beer and Bacon won the trophy for the greatest consumption and so lived up to their nomenclature, although there is perhaps not too much science involved! We retired to the Espace Culturel and were given a superb Sri Lankan curry prepared and cooked by Suzy Perera and Tchiwanke Hewa. Thanks also go to the many who helped on the day: the master of all Ann Mitchem; umpires Maurice Mitchem, Rod Joyce and Mike Lomax; scorers Sian Crozier and Pauline Holloway; beer and tea tent managers Maggie Lomax and her sister Alison; and lunch preparation and service Yvonne and Hanah Slack. Yes a successful day for the club, we thank you all for coming, a lot of fun had by a lot of people and we look forward to seeing you in 2019.